Please show your support for this site by donating via the PayPal box . You can help support the Walt Dated World website in several different ways. Subscribe to and continue to watch the Walt Dated World YouTube channel, contribute via any PayPal button on the site or shop using the Amazon search box at the bottom of each page. Proceeds fund the continued operation of the site. Thank You! This pavilion opened on October 19, 1989 and was initially sponsored by Metropolitan Life Insurance Company (MetLife). Groundbreaking started a year earlier in January, when Goofy used dynamite to get things off to an explosive start. The pavilion allegedly cost $100 million to build. The original arched sign above gave the illusion of floating on columns of water. This sign was later taken down and remodeled and installed at the parking entrance to the Magic Kingdom, minus the water columns. 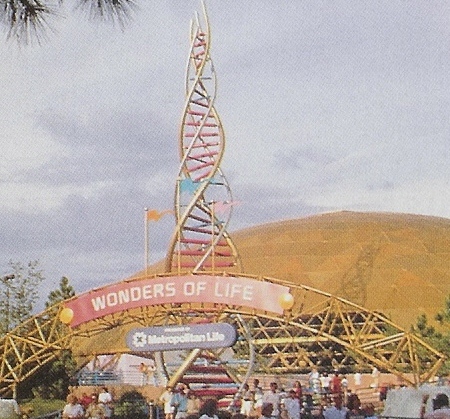 The outside of the pavilion featured a 75-foot (some sources say 72-foot) sculpture of DNA called "Tower of Life". The actual pavilion was 250 feet in diameter, 65 feet high, and had a 100,000 square foot geodesic dome clad in gold anodized aluminum. There were two buildings attached to the dome that housed the Body Wars and Cranium Command attractions. 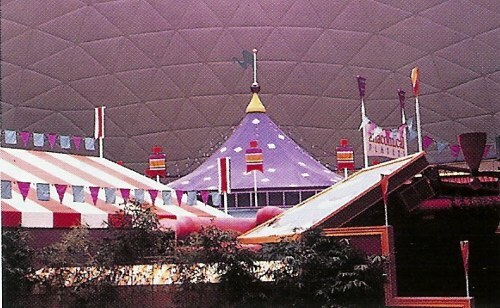 As guests walked into the pavilion, they would see a mobile that was 50 feet in diameter and would often encounter a radio-controlled blimp that featured Snoopy. 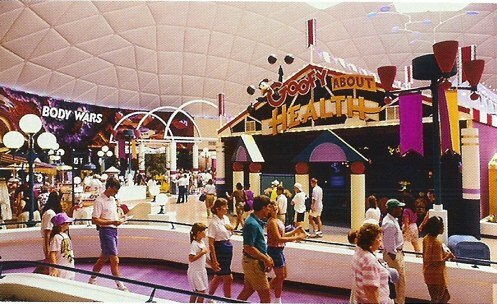 A pavilion about Health and Life was originally slated to open along with the rest of EPCOT Center in 1982. Herb Ryman even did a concept painting of the proposed area. Supposedly the building was put on the backburner because the Imagineers were limited by technology, but it's more likely that a sponsor could not be found to fund the construction. 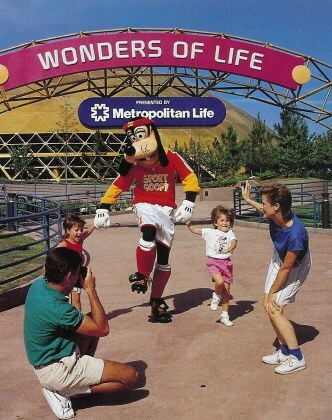 When Wonders of Life opened in 1989, MetLife CEO John Creedon stated how the pavilion would "continue the MetLife tradition of educating the public about good health and healthy lifestyles" and he predicted that "through Disney's entertainment magic, our pavilion will continue to do that through the 21st century." Sadly, he was wrong. The future for Wonders of Life does not look promising, although it was kept around to serve as a guest overflow area during the construction of Mission: Space. Even then, it was often open only seasonally. It was most recently open for the Christmas season 2006 but closed again in January of 2007. The pavilion is opened used as a special event area for the Food and Wine Festival and the International Flower and Garden Festival. In February of 2019, Disney announced that Wonders of Life will be transformed into a pavilion "devoted to playful fun". 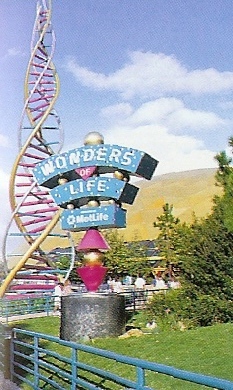 Here's the original entrance to Wonders of Life, complete with sponsor sign and water fountains. Notice how this arch has three flags on it, while the promotional photo above with Goofy does not. The arch was later removed and reused at the Magic Kingdom parking plaza. This replacement sign wasn't as impressive but still had the sponsor's name on it. After MetLife ceased to sponsor the pavilion around 2001, the sign looked like this. This is an unofficial fan site that is not affiliated with the Walt Disney Company or Disney theme parks. All copyrights acknowledged. Please respect the work I put into compiling both existing and my own information on this site by not linking to any text or pictures without crediting that they were located on this site.